Gordon (hamstring) practiced in a limited fashion Wednesday. Analysis: Gordon sat out the Chargers' Oct. 21 win over the Titans in London after heading into that contest as a game-time decision. Following the Chargers' Week 8 bye, Gordon appears to be trending in the right direction in advance of Sunday's game against the Seahawks. Austin Ekeler -- who drew the start at running back for the team in Week 7 -- waits in the wings in the event that Gordon's hamstring issue flares up as the week progresses. Gordon (hamstring) is a candidate to return for Sunday's game at Seattle, Eric D. Williams of ESPN.com reports. "The week off really helped Melvin," coach Anthony Lynn said. "He ran well last week. He's going to do some things this week, and we'll see where he's at. But hamstrings can be tricky, so you don't want to rush those." Analysis: Gordon was held out of the Chargers' last contest on Oct. 21 (a 20-19 victory against the Titans in London) after he was unable to get through a pregame warmup. With a bye week to improve the health of his hamstring, he'll tackle Week 9 prep with the intent to play Sunday. As Lynn mentioned, hamstring injuries can linger, so Gordon's status is one to watch as the week continues. Another absence would allow Austin Ekeler to remain in the starting lineup. Coach Anthony Lynn expects Gordon (hamstring) to return at full strength after a Week 8 bye, Ryan Kartje of The Orange County Register reports. "I felt like I had to protect him today," Lynn said Sunday after a 20-19 win over the Titans. "I don't want this to be a lingering thing. I want to get him back for Seattle (on Nov. 4). He's got a bye week off. He can get healthy, and hopefully we'll have a full-speed Melvin back in a couple weeks." Analysis: A late addition to the injury report, Gordon was held out of Sunday's contest in London after he was unable to make it through pregame warmups without aggravating his hamstring. Austin Ekeler has been fantastic in a part-time role, but he struggled when tasked with the lead job Sunday, gaining just 42 yards on 12 carries and 26 yards on five receptions. Gordon seemingly has a good chance to be ready for a Week 9 game in Seattle. Gordon (hamstring) is inactive for Sunday's game against the Titans in London. Gordon (hamstring) will give it a try pre-game Sunday against the Titans in London, but if there is any doubt about his availability, the Chargers will make him inactive, Ian Rapoport of NFL Network reports. Analysis: Per Rapoport, there isn't a lot of optimism about Gordon's availability, but the team will see how he feels. Should Gordon miss the game, Austin Ekeler would be in for a larger role. Gordon (hamstring) is likely to be a game-time decision for Sunday's game against the Titans in London, Adam Schefter of ESPN reports. Analysis: Gordon was downgraded to questionable earlier Saturday after initially not receiving an injury designation. The Chargers also signed running back Detrez Newsome for depth purposes, which is hardly a good sign for Gordon's potential availability. Kickoff for Sunday's game is at 9:30 a.m. EDT, so fantasy owners will need to be ready for a potential lineup change come morning. Should the 25-year-old be unable to suit up, Austin Ekeler figures to be in line for a heavy workload against the Titans. 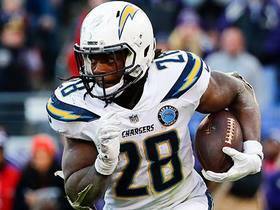 Gordon (hamstring) has been added to the injury report as questionable ahead of Sunday's tilt against the Titans, Ricky Henne of the Chargers' official site reports. Analysis: A hamstring injury left Gordon limited at Friday's practice, but he was ultimately not placed on the final injury report. However, the Chargers added him to the report as a precautionary measure Saturday. It is unclear if the big-time back has suffered any type of setback. 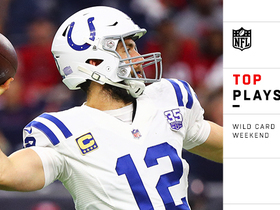 With Sunday's game being in London it will be important to check on his status ahead of the 9:30 a.m. EDT kickoff. Should things take a turn for the worse, Austin Ekeler would be in line to replace him at running back. Gordon was limited at Friday's practice because of a hamstring injury, Ricky Henne of the Chargers' official site reports. Despite his limitations, Gordon won't be listed on the Chargers' injury report ahead of Sunday's game against the Titans in London. Gordon rushed for 132 yards and three touchdowns on 18 carries while catching two of four targets for 18 yards in Sunday's 38-14 win over Cleveland. Analysis: Gordon opened the scoring with a four-yard rushing touchdown, then added scores from 10 and 11 yards out in the third quarter. He's been a touchdown machine this season, with six on the ground and three more through the air. Gordon should be treated as an RB1 in all matchups, including the upcoming Week 7 home tilt against Tennessee. Gordon carried the ball 19 times for 58 yards and a touchdown, and he caught all four of his targets for 62 yards in Sunday's 26-10 win over the Raiders. Gordon rushed 15 times for 104 yards and caught seven of his 10 targets for 55 yards and a touchdown in Sunday's 29-27 win over the 49ers. He also added a two-point conversion. Analysis: Gordon caught a six-yard pass from Philip Rivers to cap off the Chargers' first drive of the second half for a 23-17 lead. Later on in the same quarter, the 25-year-old was very fortunate not to lose a fumble close to the San Francisco end zone. The performance marked Gordon's first 100-yard rushing effort of the season and his third straight game with a touchdown. He'll look to keep rolling Week 5 at home against Oakland. Gordon carried the ball 15 times for 80 yards and a score during Sunday's 35-23 loss to the Rams. He also caught two of his four targets for four yards. Gordon (neck) was a full participant at Wednesday's practice. Analysis: Gordon sustained an unspecified upper-body injury during the Chargers' 31-20 win over the Bills last Sunday, with Los Angeles deeming it a neck issue in their first practice report of Week 3. More important than the specificity of Gordon's injury is the fact that he was on the practice field at full capacity, putting him on track to suit up this weekend in a difficult matchup with the Rams. Gordon suffered an upper body injury early in the fourth quarter of Sunday's 31-20 win over the Bills. according to Eric D. Williams of ESPN.com. He finished the contest with 64 total yards and three touchdowns. 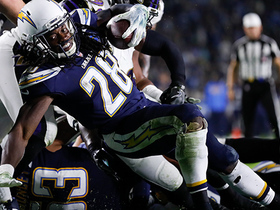 Analysis: Coach Anthony Lynn dismissed the notion that his star running back might have suffered a serious injury, suggesting Gordon was simply sore and fatigued. 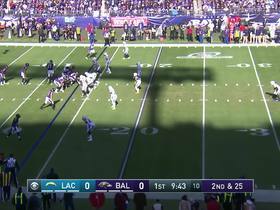 The fourth-year player left Sunday's game at the 11:56 mark in the fourth quarter and did not return, but by that point the Chargers already held a comfortable lead over their opposition. Should Gordon play next week, he'll face a surging Rams squad that has outscored opponents by 67-13 tally through the first two weeks of the season. Gordon recorded nine carries for 28 yards and a touchdown and added six receptions (on seven targets) for 38 yards and two more scores during Sunday's 31-20 win at Buffalo. Gordon carried the ball 15 times for 64 yards and caught nine of 13 targets for a career-high 102 yards in Sunday's 38-28 loss to the Chiefs. Analysis: Gordon wasn't able to get much going on the ground, and with the Chargers trailing in the second half, quarterback Philip Rivers used him on a plethora of checkdowns. His receiving numbers have improved in each of his first three years in the league, so it's quite possible we'll see even better production from Gordon in the passing game in 2018. Gordon (personal) is good to go for the regular season, Greg Beacham of the Associated Press reports. Analysis: Gordon was away from the team during preseason Week 3 to deal with a family matter and, as is customary for elite running backs, didn't take the field in the Chargers' exhibition finale. No matter, he'll be good for his typical workhorse role in 2018 after accounting for 21.4 touches per game a season ago. Gordon (personal) did not play in Saturday's preseason game against the Saints. Analysis: Gordon didn't play in order to tend to a family matter, leaving Austin Ekeler to work as the Chargers' featured running back. Gordon was the one on the field for 25 of the team's 29 first-team snaps during the first two preseason games, though -- including four-of-five snaps on third down -- so look for him to instantly reassume workhorse responsibilities when the games start to matter. Gordon carried the ball 10 times for 35 yards, caught both of his targets for 18 yards and also scored a touchdown in the Chargers' 24-14 preseason win over the Seahawks on Saturday. Analysis: Gordon played just three drives, but he looked explosive in his limited touches bursting for a 14-yard carry that led to a two-yard touchdown three plays later. 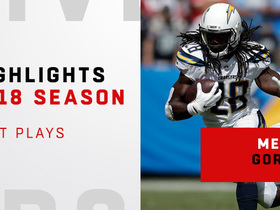 The 25-year-old remains an integral part of what figures to be a dynamic Chargers offense and has drawn rave reviews throughout training camp for his improved route running. Gordon makes for a solid cornerstone late in the first round or early in the second round of most drafts. Gordon said he is working to diversify his route running, ESPN.com's Eric D. Williams reports. 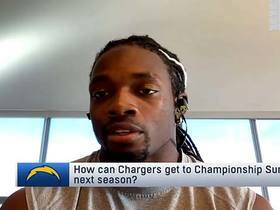 The Chargers officially picked up Gordon's fifth-year contract option Wednesday. The Chargers are slated to pick up Gordon's fifth-year option, a move that would keep the 25-year-old under contract with the team through the 2019 season, the Los Angeles Times reports. The Chargers may look to acquire another running back during the offseason in an effort to manage Gordon's workload, ESPN's Eric D. Williams reports. Gordon (ankle) carried the ball 17 times for 93 yards and also caught six of his seven targets for 31 yards in the 30-10 shellacking of the Raiders on Sunday. Gordon (ankle) is active for Sunday's game against the Raiders. Gordon (ankle) is expected to play Sunday against the Raiders, a league source told Adam Schefter of ESPN. Analysis: Gordon is listed as questionable on the official injury report. Gordon appeared to be moving okay Friday while running routes at practice, so this report adds to the outlook that he will play. However, this report isn't his official status so fantasy owners will need to check his availability before Sunday's 4:25 ET kickoff. Gordon (ankle) is listed as questionable for Sunday's game against the Raiders. 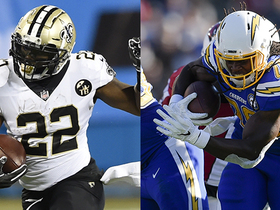 Analysis: We'd expect Gordon to give it a go Sunday, with the Chargers still in the playoff hunt, but that may not be confirmed until about 90 minutes before Sunday's 4:25 ET kickoff, upon the release of the team's Week 17 inactives. 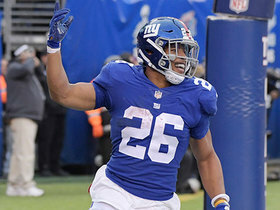 Per ESPN's Eric D. Williams, Gordon appeared to be moving okay Friday while running routes at practice, which supports the notion that the running back should be able to tough things out in Week 17. 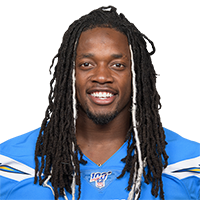 The Chargers listed Gordon (ankle) as a limited practice participant Thursday. Analysis: It was thought that the running back would be listed as a non-participant, but evidently he got some work in Thursday. Assuming his ankle responds fine to the work he put in, Gordon would appear to be headed toward active status Sunday against the Raiders. More on his status no later than Friday, when the Chargers release their final Week 17 injury report. Gordon (ankle) won't practice Thursday, but Chargers head coach Anthony Lynn is optimistic the running back will turn in a limited session Friday. Gordon (ankle) won't practice Wednesday, Eric D. Williams of ESPN.com reports. Gordon is dealing with minimal swelling around his sprained left ankle and is optimistic about his chances of playing Sunday against the Raiders, Ian Rapoport of NFL Network reports. 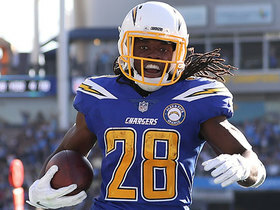 Head coach Anthony Lynn said Monday that Gordon (ankle) could be a game-time decision for Sunday's regular-season finale against the Raiders, Eric D. Williams of ESPN.com. "He's seeing the doctors tomorrow [Tuesday], and we'll know more about Melvin as we get going here," Lynn relayed. "But he's another guy that's probably going to come down to the end of the week." Analysis: In the aftermath of the Chargers' ugly 14-7 win against the Jets on Sunday, it was revealed Gordon hurt his ankle during the game. As of Monday, Gordon's left foot is encased in a walking boot, likely as a precautionary measure than anything nefarious. 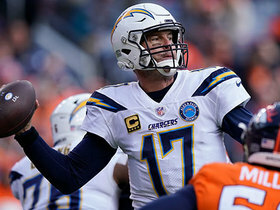 In any case, his status is worth monitoring as the week goes on, as his services will be needed to put the Chargers in their best position to earn a playoff berth. Gordon, who recorded 19 carries for 81 yards and a TD in Sunday's 14-7 win over the Jets, sustained an ankle injury in the contest. Analysis: Gordon also caught three passes for 47 yards Sunday, to complete a solid Week 16 fantasy stat line, but his status will need to be monitored as the Chargers' regular season finale approaches. With Austin Ekeler dealing with a hand injury, Branden Oliver served as Gordon's top backup this week, logging eight carries for nine yards. Gordon carried 19 times for 78 yards and a touchdown Saturday against the Chiefs. He also caught six of eight targets for 91 yards in the 30-13 loss. Gordon carried 22 times for 78 yards and a touchdown in Sunday's win over the Redskins. He added one catch (on three targets) for five yards. Gordon carried the ball 19 times for 77 yards and also caught all four of his targets for 29 yards in the 19-10 win over the Browns on Sunday. Gordon carried the ball 21 times for 65 yards and caught three passes for 23 yards in the 28-6 win over the Cowboys on Thursday. Gordon carried 20 times for 80 yards and one touchdown during Sunday's 54-24 victory over the Bills. He caught neither of his two targets in the passing game. Gordon carried the ball 16 times for 27 yards and also caught five passes for 15 yards in the 20-17 loss to the Jaguars on Sunday.